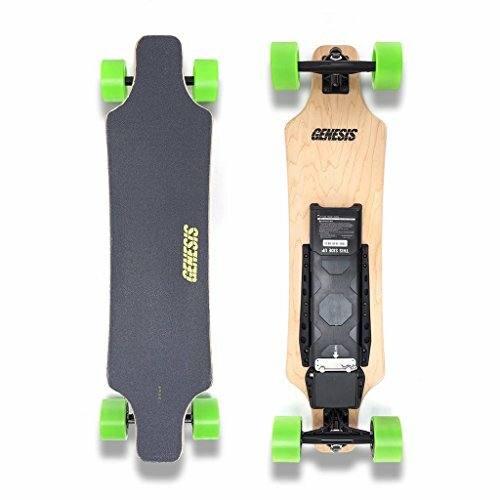 Looking for electric skateboard reviews? This collection includes the best electric skateboards you can buy today, and pits them against each other based on all the important features: range, top speed, motor power, weight, charging time, and cost. Compiling data from multiple online sources, we’ve looked at sales data and owner reviews from 2016, and mashed them together with the best priced cheap electric skateboards from 2017 to give you our top recommendations. If you already have a board, you may be interested in building your own electric skateboard with a kit that adds an electric motor and battery pack to your existing deck. The Liftboard electric skateboard might gets its name from the integrated handle, making carrying this 14.8lb board as easy as riding it. With a powerful 900-watt motor, the Liftboard can zip you along at 16 mph up to 16 miles! They say it can handle grades up to 15 degrees too. Charging the board takes only 3 hours. With a 7-ply deck providing some suspension on roads that aren’t perfectly smooth, the 39″ length gives you space to move around on. A 90 day warranty covers any issues you might have, with Liftboard promising that any of your problems will be “made right.” Keep in mind that Liftboard does not recommend riding in the rain, and warranty does not cover water damage. If you want an electric board for commuting, this might not be it if you live anywhere that gets rain.